T-shirt transfer printing technology continues to evolve. And you can find the latest advancements in the Digital HeatFX i550. This little powerhouse is WAY more than a just an ordinary t-shirt printer. Packed With New Brightness and Crisp Pop Colors. The i550 gives you the ability to print full-color designs including our latest florescent white toner technology. Imagine a brightness that is unlike anything else you’ve ever seen. An industry exclusive. The fluorescent white toner and other colors used in the i550 gives you a brightness that could otherwise only be achieved through a messy, complicated wet printing process. But we’re talking about a TONER printer here. That means it’s ultra fast, has no messy inks and virtually no maintenance. It is the ultimate in compactly sized printing. Most t-shirt printing technology is bulky and requires a large planned out space. The i550 is less than 16 inches wide, which means it fits on the corner of a desk (find out why this is a big deal later on!) The i550 transfer paper is an A-4 size (8.27x11.69), this size lets you print left chest logos up to full-size t-shirt prints. Every i550 comes with SmartCut, the most useful piece of software in your shop for a compact printer. SmartCut will automatically divide or “Cut” even the most complex designs in ways so that they can be joined together easily. You can go larger and larger and larger even though you are using a smaller printer. It’s surprising how big you can print. This software is simple too. It contains an artificial intelligence built in that picks the best places to cut your design for easy placement with no obvious cut marks. It’s the first t-shirt transfer printer that takes you from ideas to dreams without having to invest tens of thousands of dollars first. Go far beyond custom t-shirt printing and promotional items. This machine is a serious business tool for marketing, sales, and getting orders out your door. Being able to reconfigure the machine in moments is an amazing technological advancement, and the software makes it all simple. Print Optimizer works directly with your i550 and directs the output of your print jobs depending on toner configurations. The software works with presets that are designed to work with your desired output, while visually displaying the proper toner positions. A process that seems like it would be a challenge is all completed in clicks of a mouse. When creating customized apparel, two colors have often caused strife: white and black solid prints. The ability to swap between a fluorescent white toner and a black toner cartridge means the i550 creates transfers that have never been seen before in the digital transfer world. There are also option fluorescent color toners that will let you create decorated garments, etc. that even glow in black light. They give off that bright neon look for the brightest colors out of any toner printer. This option alone will give you capabilities your competition cannot create with their older technologies. The i550 gives you the power to say YES to fluorescents, bright whites, and beautiful deep blacks. You can Print Glitter Too. That’s right, full-color GLITTER transfer is so exciting, and its worth its own mention You’ll use an optional toner and adhesive paper to create transfer prints that glitter and sparkle. Glitter transfers are created with a process of using clear toner and a special adhesive paper that has glitter build into it. The process is very similar to standard transfer production and the results are amazing. 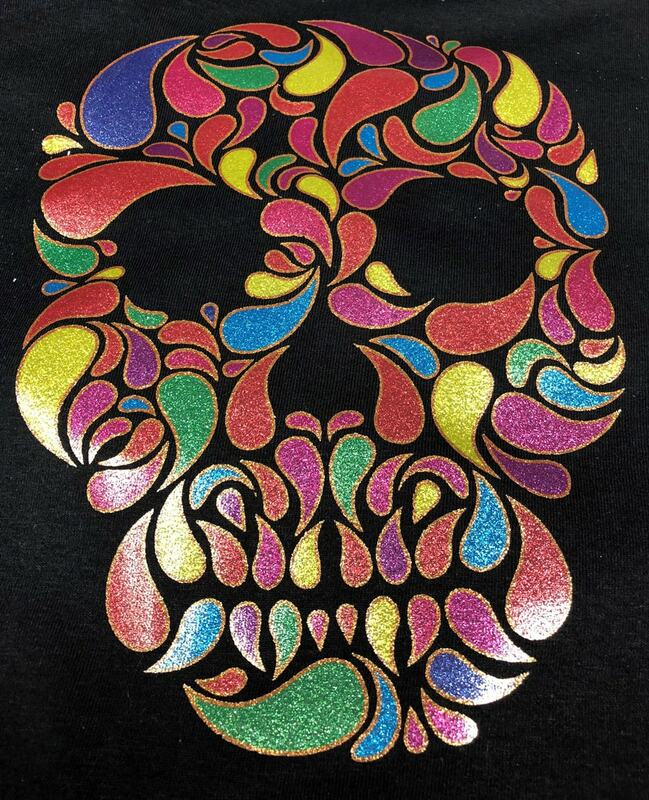 Producing full-color glitter prints is easy and will be unique to your business. This technology is new and exciting. The reaction from your customers will be priceless, plus you may be the only person in town offering this type of transfer. Customers are always looking for new styles and hot trends. One of the trends that are topping the charts is the new white toner printers making super bright neon looking t-shirts. Check out how these fluorescent prints glow under a black light! Welcome To A World Of Sublimation Printing Without Messy Sublimation Inks! Everything about the DigitalHeatFX i550 is exciting, but many people feel sublimation toner is the most amazing feature. Optional sublimation toners let you swap the standard CMYW set for a CMYK Sublimation set. This configuration will give you the advantages of sublimation, with the speed and ease of toner. No more messy inks, slow printing or needing additional equipment. Without getting into a long definition, sublimation lets you penetrate dye into light-colored substrates creating a look and feel that is part of the garment. You can’t feel the imprint, and it’s a super-strong bond. 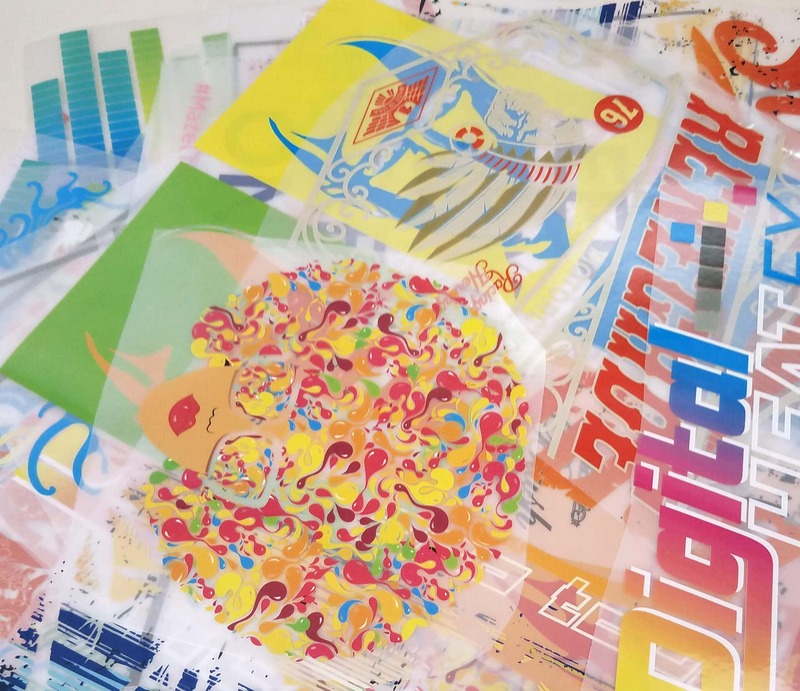 You get beautiful bright digital prints that are chemically bonded and won’t ‘crack’ or ‘peel’ like screen printing. Sublimation also works on other popular promotional items like mugs, coasters and tons of other substrates. Your white toner t-shirt transfer printer, which can do all these other amazing things, just became your Go-To Sublimation Printer as well. Probably the easiest thing for your i550 to handle is your day to day printing. You get the reliability and durability of an industrial printer and professional management software, but you get to use it for your day to day printing needs as well. Neat Trick huh? When you quick-swap your White Toner for regular black toner, you can print with your i550 just like a regular office printer. That means you can put in plain copy paper and print directly from your Windows PC. Invoices, thank you cards, sales orders, tax documents and everything else that comes with running a business. The printer on your desk corner is a t-shirt printer and industrial level office printer. The i550 is a full-color business printer. Your business can print flyers, brochures, and mailers for marketing. You make money on T-Shirts. Why not make money on the many other hundreds of printed and promo items as well. Your money maker is your sales and marketing printer as well. This is a truly revolutionary advancement in transfer printing. The output of the i550 has the capability to banner print at nearly 50 inches. Your t-shirt printing equipment has never done things like this before. Transfers can also be printed and sold to the wholesale market for shops that don’t have your technology. You can Print bright white t-shirts in full color with no liquids, no weeding and at a rapid speed. It’s the only printer that creates fluorescent colored prints for one job and then can swap to CMYK for printing marketing materials or office paperwork. Your new i550 is going to be your favorite piece of equipment and gives you the power to exceed your goals and achieve your business dreams. Watch this video to see the DigitalHeat FX i550 in action. Hotronix Auto Clam Heat Press 11" x 15"
Call 855-348-4839 to speak with a product specialist today or choose the link below. Apply for financing online now. Once you are approved an agent will reach out to you.